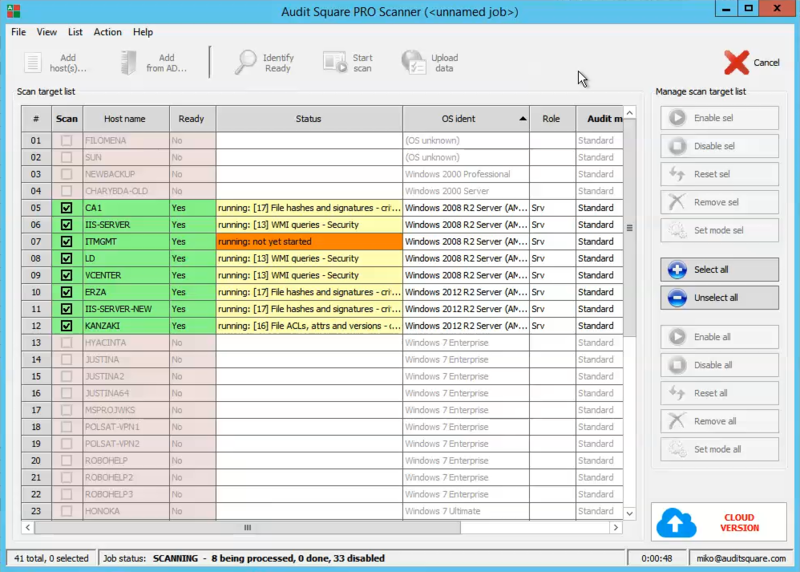 What is “Audit Square Scanner”? The scanner is intended for remote assessment of multiple computer at once. In order to assess a computer remotely with scanner you need Local Administrator privileges on target computer. 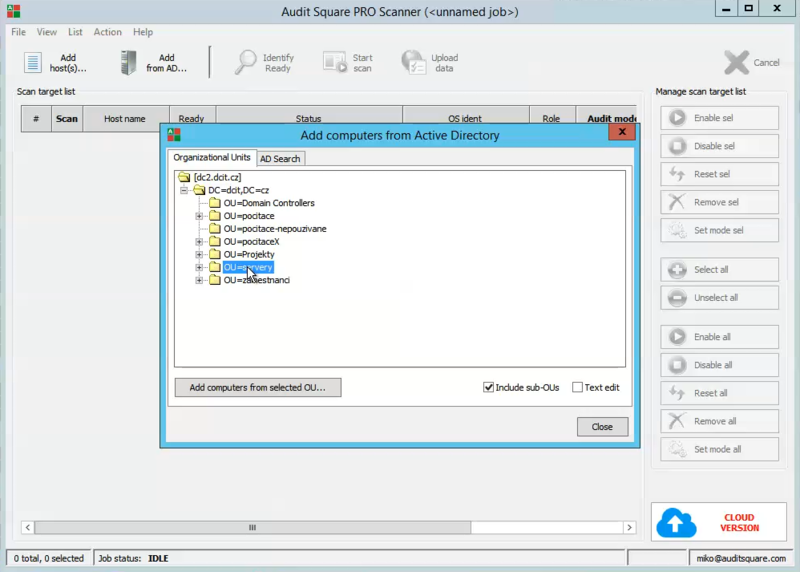 The scanner is especially handy in MS domain environment but you can scan also standalone computers providing they are remotely accessible over network. The Agent is distributed either as Portable ZIP package or MSI installer package. 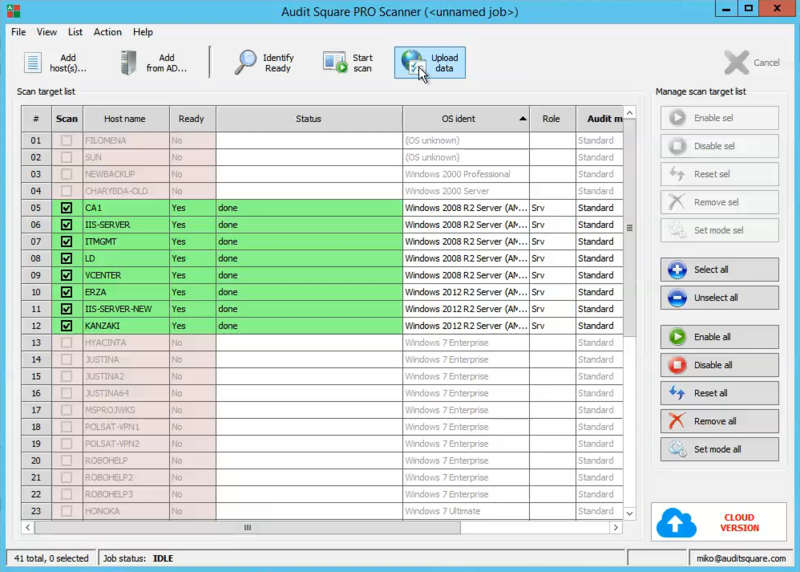 MSI installer - intended for internal auditors and/or internal IT security specialists, it is usually installed on auditor's desktop (or management server). Although it is called a scanner it does not utilize techniques like port scanning or vulnerability scanning. Instead it connects to the target computers, puts there a small collecting ephemeral-agent which is started on the target computer. Once the data collection is finished the scanner gets back collected data and cleans after itself. or you can just get the data (*.rsa file locally stored on the computer where the scanner is running) and upload them later via web browser to the portal for processing. Next click the button Start scan - the scanning runs in parallel and on most of the computers it should finish within 5-10 minutes. After scanning finished on all computers you have all collected data locally (on the computer where you run scanner) and these data should be uploaded to the portal for urther processing. 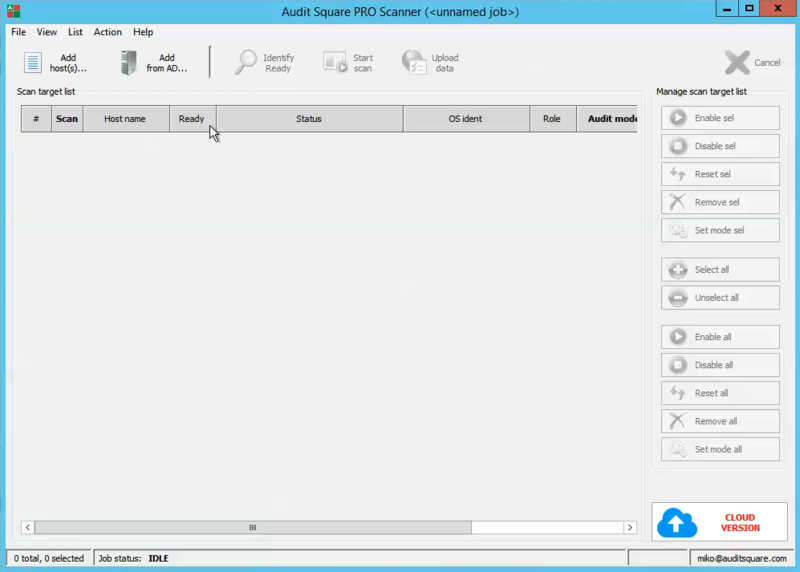 Before the upload starts you will be asked for authentication with your Audit Square account. 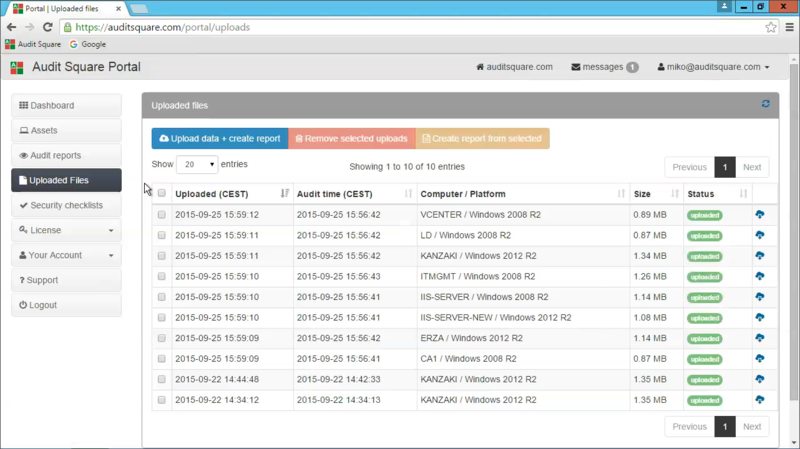 On the portal you can create different (single computer or multi-computer) reports from the data once uploaded from the scanner - no need to run the scan again for each new report. 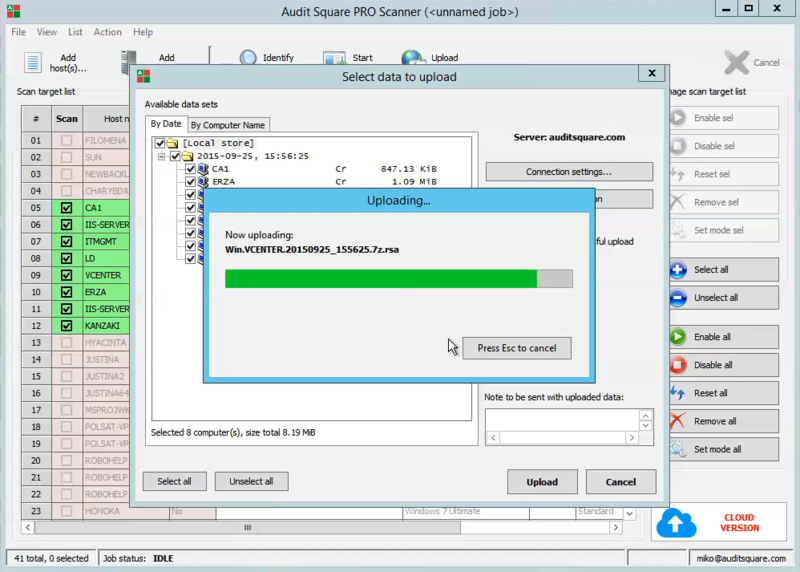 The former command will only do scanning, whereas the latter one will upload the data to portal as well. Scanner's CLI version (AuditSquare-Scanner-cli.exe) has to be run under the same account as GUI version used to save the job file .sess. No interactive authentication is possible during the command-line scanning, hence the account used to run the command has to be privileged enough to perform the scan. Job file (.sess) is not modified in any way during the command-line scanning. This behaviour is intended to allow the repeated scans (e.g. via scheduled task), but may lead to undesired effects when CLI and interactive GUI versions are used interchangeably.